We know how keen kids are to come and play paintball and we totally understand why because its so much fun however we feel its important to offer paintball options geared to a guests age and ability and to give parents options to ensure there kids are not mixed in with adults unless that’s what they are happy to do. 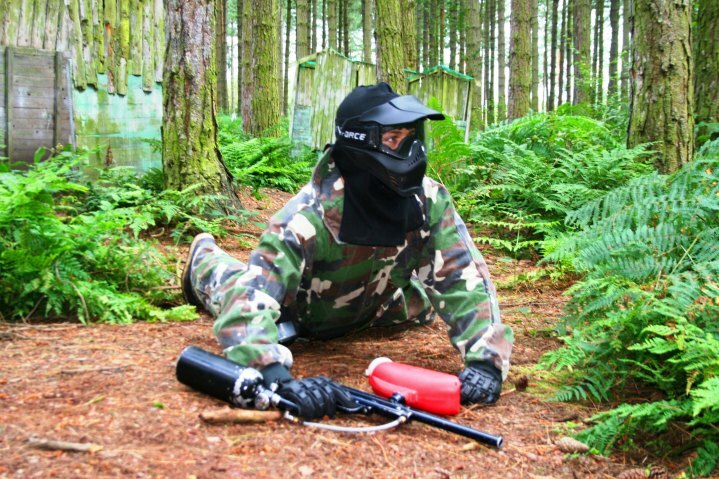 At The Paintball Jungle in Sherwood Forest we have 3 different paintball options. This page is all about GOTCHA and CADET paintball so please scroll down the page to read all about these options to make sure you find the paintball event that best fits your requirements. If you have a group of experienced young paintballers (aged 11 years plus) or have a group of adults and kids then please take a look at the other paintball pages on this website for more information about the Traditional Paintball options we can offer you. For players that are 8 years or older. Fixed cost £20 per person and includes inc 250 paintballs per person. Guests CANNOT buy any more paintballs so NO big bill for Mum or Dad. Paintballs issued across event so they cant shoot all their balls in game 1. Coveralls, Goggles, body armour provided, all they need to bring is gloves. 2hr sessions are run at weekends and school holidays. Private events available for groups of 16 or more players . No WiFi, No PlayStations just outdoor fun, They may come back dirty ! This event is all the fun of regular Paintball but with lighter ‘Gotcha guns’ and smaller Paintballs which have a Lower Impact than standard paintballs greatly reducing how it feels when you get hit . 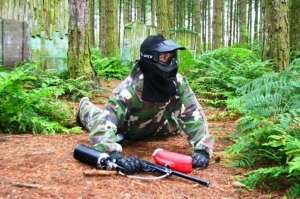 This now means younger kids can experience the fun and thrill of paintball at our amazing woodland venue is Sherwood Forest with less of a risk of bruises that sometimes accompany playing the regular game favoured by Teenagers and Adults. Priced simply at just £20 Per person including all clothing, equipment and 250 Paintballs the guests each will play not less than 4 games over around 2 hours sessions, with start times of 10am or 12pm during winter with a 2 pm also available in the summer months. This event is specifically for younger guests but as we know this will be mainly for birthday parties we will be allowing parents / guardians or an older sibling to play alongside the birthday guest but we guarantee to never mix a group of adults into a “Gotcha” sessions keeping this all about a fun family and friends paintball experience. To find out more, or to book a ‘Gotcha’ Paintball activity with us today, contact our fun and friendly team of professionals. We promise to give you and your kids a day to remember. This event requires a minimum of 10 players for it to be fun to run so if you have less than 10 in your group, please give us a call so we can find other groups to pair you up with. If you have 16 or more then we can run you’re a private Gotcha paintball sessions so call us to check availability. For 11 year olds that have left school year 6 up to a maximum age of 16*. Fixed cost of just £25 per player which includes 400 paintballs per player. Open secessions on the 2nd Sunday every month for smaller groups. 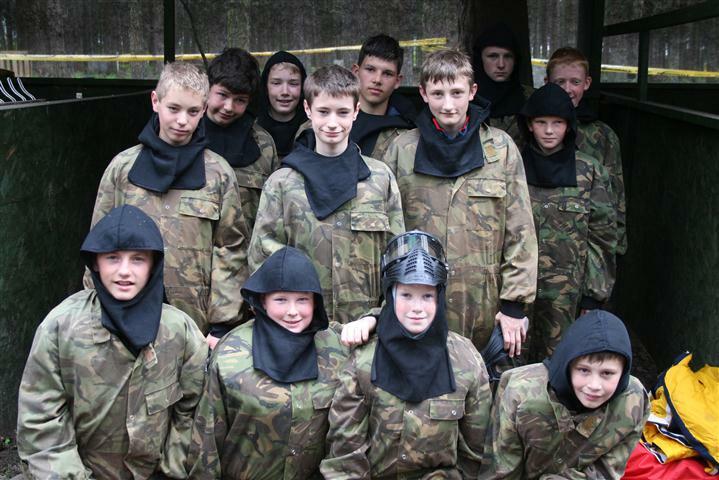 If you are 11 -16 years* old or a parent and are looking to arrange a paintball event / party for a birthday, school trip or end of season event for your sports club / team, the Paintball Jungle Cadet Event is ideal. 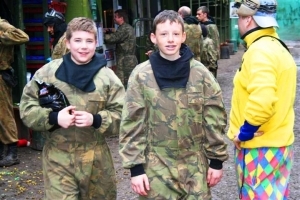 The Paintball Jungle is very keen to promote a fair and level playing field for every level of paintballer which is why in our opinion the Cadet Paintball event is ideal for junior paintballers that are 11 -16 year olds*. 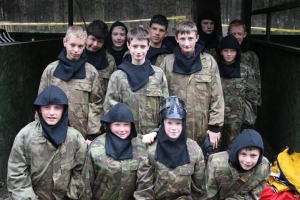 Each junior will be kitted out in all safety equipment and protective clothing including body armour so they are fully protected along with state of the art paintball markers along with fully trained event staff and 150 acres of Sherwood Forest for them to run around in screaming and shouting as much as they like. The event cost of £25 per player is fully inclusive so ideal if you need a party to stick to a budget. 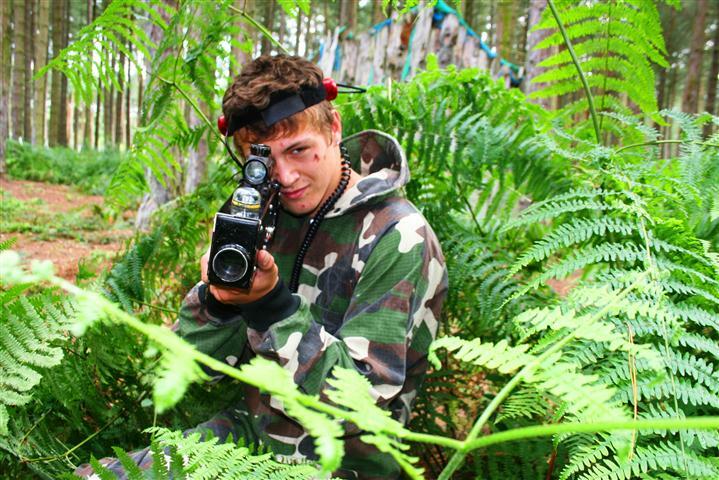 We provide everything they will need including 400 paintball all for the £25 entry fee. As we know kids can often go trigger happy when playing paintball so we won’t be giving these budding Rambo’s all 400 paintball at the beginning of the event like some venues do often meaning after game 1 the kids have ran out of paintballs meaning your wallet or purse gets hit because you have to buy more ammo. We will issue each player with paintballs at intervals across the event so the worst that can happen is that if they go mad in game 1 and shoot all there allotted paintballs they may have to sit out a game but trust us when we issue the next lot of paintballs they will have learnt a valuable lesson so it’s very rare they do it again. We find this approach works for all groups as no one player has an advantage over another. They all have the same kit and number of paintballs regardless of how much pocket money they may get and we guarantee to never allow cadet paintballers to purchase any additional paintballs so it’s fair for all thereby delivering a fair & thoroughly enjoyable day. To be able to play in our cadet paintball event each member of the group must either have a completed parental consent form which can be downloaded by clicking HERE or have an adult with them on the day that can counter sign the form that the cadets will have to complete on arrival before they will be permitted to play. It’s all about team work and the great outdoors, no Nintendos, PSP’s or X Box allowed! Got kids aged 8 + but do not want paintball? If you have up and coming warriors desperate to paintball but you are not sure your they are quite ready for the rough and tumble of paintball why not check out our Laser Tag event. Played in the great outdoors Laser Tag offers the thrill and excitement of paintball without projectiles so ideal for those wanting to take the next step after Quasar but not quite ready for paintball or having already played paintball they enjoyed the thrill but not the bruises. We understand that you may have questions or need more information prior to making a booking with us. If so please call and speak to one of our human beings on 01623 883980. Or, Click here to Enquire Now by email if you prefer.